In November 1977 Sean Daly opened his doors to the public at 34 Henry Street, Kenmare, Co. Kerry. At that time Sean Daly & Co offered Auctioneering/Real Estate services, Insurance & financial services. Since that time the office has grown substantially and now employs a total of 6 staff. Sean Daly & Co has gone from strength to strength and has always been able to adapt to an ever changing world. On the 1st of February 2004: The real estate section of Sean Daly & Co joined the franchise of Sherry Fitzgerald and the Sherry FitzGerald Daly Kenmare brand was formed. This was an important leap forward for the auctioneering side of the firm. The directors felt that joining the Sherry Fitzgerald franchise would offer our clients properties a national brand and a network of 97 Sherry FitzGerald offices in which to market their properties. 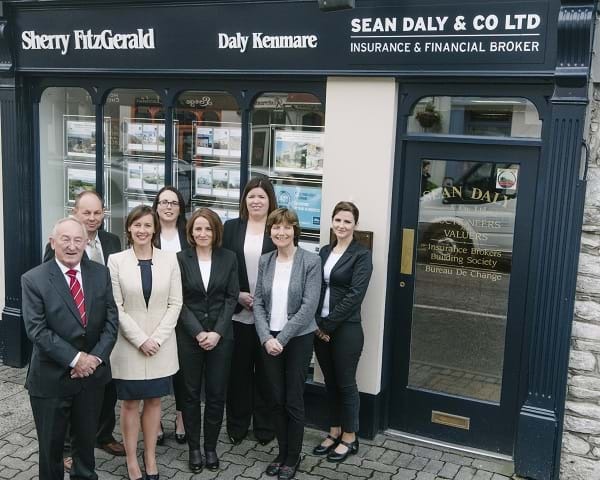 Sean Daly & Co is still very much involved with the insurance and financial services part of business. We offer our general insurance customers the choice of products from 28 companies. The firm also offers financial products through our 7 life companies and 3 deposit agencies. Sherry Fitzgerald Daly Kenmare offers a wide selection of property including new homes, holiday homes, 2nd hand residential houses, commercial property, licensed premises and agricultural (forestry & farm holdings). Geographically our office covers a large area around the Kenmare Bay and West Cork Area. Extending along the Beara Peninsula, taking in Glengarriff, Adrigole, Eyeries, Ardgroom, Lauragh, Kilmakilloge, and Tuosist. Along the Ring of Kerry / Iveragh peninsula the office would cover Kenmare, Kilgarvan, Templenoe, Tahilla, Rossdohan, Sneem, Gleesk, Castlecove, Caherdaniel, Derrynane, Waterville and Ballinskelligs. Sean Daly (MSCSI) and John Daly (MSCSI) (MRICS) B (sc) Val are at hand to assist you with the over 100 property listings that are available through Sherry Fitzgerald Daly Kenmare. Sean and John are both members of the Society of Chartered Surveyors of Ireland. The firm has also been able to offer our services for the purposes of valuations, public auctions, arbitration, expert witnesses or rating reviews. In 2004 Sean Daly & Co Estate agent joined the franchise of Sherry FitzGerald. By joining Sherry Fitzgerald we have added new dimensions to marketing our property portfolio for clients. There are 97 Sherry FitzGerald offices throughout Ireland which gives our customers access to a wider audience. We provide a range of property web site which we advertise all our properties through, www.seandaly.com, www.sherryfitz.ie, www.daft.ie, www.myhome.ie, www.property.ie and the number 1 UK web site www.rightmove.co.uk. The City & Country Magazine is produced by Sherry Fitzgerald. 40,000 copies are printed for each edition and distributed through all the Sherry Fitzgerald offices. We can also provide marketing campaigns in both local and national press. Also as part of our marketing campaigns for High end luxury properties we team up with Sherry FitzGerald Country Homes & Estate & Christie’s International Real Estate. This partnership gives sellers of prestige homes in Ireland access to international markets. Sherry FitzGerald Daly has a team of 4 qualified Estate Agents. Sean Daly who founded the firm in 1977 and has 40 years of experience. John Daly joined the firm in 1997. Suzanne Teahan joined in 2002 and due to our increased business since joining Sherry FitzGerald, we now have Elaine Daly who joined the company in 2005. This experienced team has 67 years of experience and knowledge in selling and marketing both residential and commercial properties in the wider Kenmare Area. Sherry Fitzgerald Daly Kenmare offers both a Letting Only and Management Service. "Letting Only Service". The service includes free rental appraisal, listing & marketing your property, tenant screening, viewings, lease agreement, meeting the tenants, organize initial rent payments and renewal of lease. The landlord assumes the responsibility for managing the tenant from the time the tenant moves in. "Management Service" all the service included in a letting only service with the addition of full management of the property. Some other important aspects of the management service include organizing repairs, day to day liaising with the tenants as well as tenancy registration & transfer of utilities. The Landlord does not have any dealings with the tenants and has the benefit of the rent lodged into their account every month. For enquiries contact Suzanne Teahan and she will guide you through both services and help you choose the standard of service that suits your needs best. Suzanne Teahan also concentrates on our commercial lettings. Suzanne advises on the purchase, sale, leasing and acquisition of all types of commercial property. We provide advice to property owners, occupiers, investors, developers and public sector bodies. Our objective is to add value and deliver results to match client’s requirements. We act on behalf of clients to advise on the implementation, negotiation and formulation of rent review procedures as contained in commercial leases. We provide commercial valuations, appraisals and due diligence advice, we deal with a wide range of properties; shopping centre, out of town retail warehousing, offices, town centre units and land leasing. Our service to Landlords include rental appraisals, listing and marketing the property, tenant vetting, viewings, agreeing lease terms, organizing utility transfers and payments. Mary O′Farrell & Grainne O’Driscoll will assist and offer quotes for your car insurance, commercial vehicle insurance, house insurance, holiday home insurance, commercial insurance, Employers and Public Liability, Travel insurance and Boat insurance. John Daly (QFA) (APA Personal General Insurance) will assist with advice in relation to mortgage protection, life assurance, serious illness cover and your pension options. John will also advise you on lump sum investments or savings plans, which can be placed in managed funds, unit linked funds or guaranteed bonds. This allows us to operate a wide variety of deposit accounts, and we can conduct lodgments and withdrawals for our customers. We offer competitive rates for fixed term deposit rates 6 month, 1 year, 2 year, 3 year, 4 year, 5 year. There are instant access accounts, and notice accounts. Also available are deposit account in Sterling or US$. Sean Daly & Co is regulated by the Central Bank of Ireland.